The Barbados-Based Regional Security System (RSS) is to receive a grant of 1.2 million euros from the European Union to help with the fight against illicit trafficking in RSS member states. 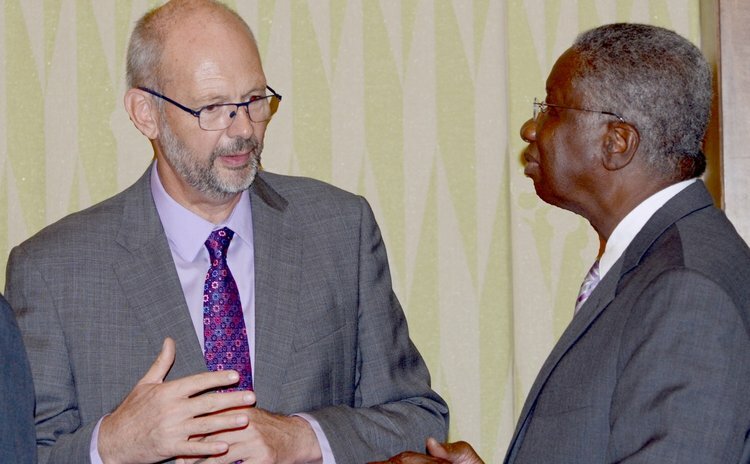 The announcement was made by Head of the European Union Delegation to Barbados and the Eastern Caribbean, Ambassador Mikael Barfod, as he addressed the Council of Ministers Meeting of the RSS on 7 March 2014. "The overall objective is to strengthen the region's institutional capacity and response to reduce drug demand, prevent crime and violence and combat illicit drug trafficking," Ambassador Barfod said. The diplomat said the EU's intervention will also enhance existing rehabilitation projects in correctional facilities for drug offenders and provide them with alternative skills as well as support public awareness about key law enforcement issues such as drug enforcement and human rights issues in RSS member states. The support will complement that being provided by other international partners in the setting up of a training academy which will enhance professionalism amongst regional law enforcement agencies. Ambassador Barfod called on the authorities to share resources as he informed that the EU has provided financial assistance towards the construction of a Maritime Training Institute in St. Vincent and the Grenadines and will soon complete the construction of a National Security Training Centre in St. Kitts and Nevis under its Safety and Security Programme for that country. He suggested that regional countries follow the examples of Grenada, Dominica and St. Vincent and the Grenadines in enacting civil asset forfeiture laws, as these approaches should be welcomed not only from a security point of view but also a revenue one. Ambassador Barfod also told the gathering that the EU will this year roll out a 12.6 million euro Crime and Security Programme under the 10th European Development Fund, which will support multiple actors in the Caribbean region including CARIFORUM, IMPACS, the Caribbean Financial Action Task Force as well as the RSS. In addition the EU is planning to allocate 45.5 million euros to security for the future 11th European Development Fund through CARIFORUM, with focus on support for crime prevention, restorative justice, improving citizen security and the fight against financial crimes.